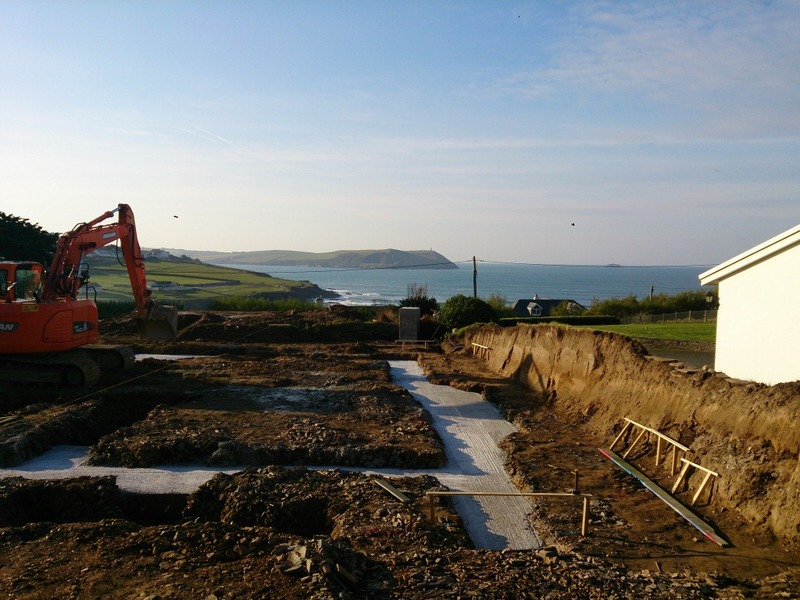 Work continues on the dream home in Polzeath and we are very excited about bringing the vision into reality. This will be an extraordinary dwelling, with many unusual and unique features. As well as all of the main living spaces having amazing sea views, the open plan kitchen, dining and living area will have large sliding doors leading onto a fully landscaped garden with stunning sunken patio areas to provide both privacy and shelter from the westerly breezes. Contemporary detailing throughout the entire property is balanced with the integration of local materials, including Trevillet slate on the roof and for the tile hanging. Luxury combines with practicality, perfectly illustrated by the simple elegance of the wet room bathrooms. To minimise interruption to the wonderful views windows are abundant and large. However, all are triple glazed and have integrated blinds, so that light and warmth can be balanced. Combined with the ground source heating and heat recovery system, keeping cosy in the winter will be easy and economical. As you may have read in my previous blog, the centrepiece of this property is its Great Glass Elevator. It is a transparent masterpiece with both the shaft and the cabin totally glazed. The effect will provide a sense of energy and quiet motion amongst the tranquil setting of the light and airy living space. Watch out for more details as construction gets underway…. The impact of this structure will be balanced with the seamless lines of a magnificent triple-height stainless steel staircase. Sweeping from ground level to roof, where occupants will be able to access the stunning terrace (or crow’s nest as the client prefers to call it) it will provide a highly contemporary feel, whilst capturing and reflecting the light to create a dynamic artwork. As the property is located only a stone’s throw from the sea, the client will also have a purpose-built, ground floor beach room with a washroom, to help keep their beautiful home a sand-free zone. Add to this the bespoke surf storage and it becomes a beach-lover’s paradise. However, getting to this point has certainly not been without some headaches and a few new lessons. My last blog referred to the planning challenges, but there were some other, more ‘root’ level issues that had to be taken into account. We have become acutely aware that whenever there is a tree in the proximity of the property, even if it appears to be the other side of any boundaries, it is important to check out where the root systems run, before advancing. Seek the support of a tree surveyor as soon as possible so that an investigation can be carried out and a report submitted with the planning application. This should include mitigation measures of how to protect the tree should it be required. Tree Protection Orders can be placed on important trees and can make the process a little more tricky but if handled correctly they may not necessarily prevent development. Saving the planet and my pocket! How Do We Create Modern Homes Fit for Future Lifestyles? Architectural Apprentice / CAD Technician opportunities. Do we really need an architect? I’m sorry – do you understand what you just said? "How do we make it easier to just get on and build stuff?" Beyond 16! Will there be room? More than the sum of the parts?? ?